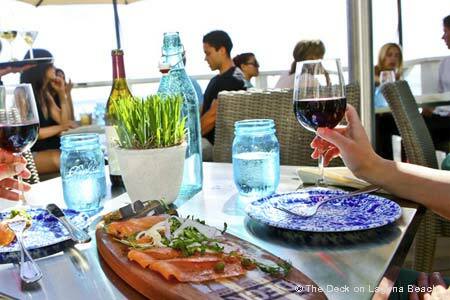 Beachfront al fresco dining showcases the Laguna Beach lifestyle through refreshing libations, seafood, and an eye-catching view. : This completely open-air venue, affiliated with the Pacific Edge Hotel, features a dining space directly on the Laguna Beach shoreline. Guests can grab a seat among cool ocean breezes, enjoy an invigorating cocktail from the outdoor bar, and watch the surf crash along the sand or observe the sun set behind Laguna’s legendary bluffs. The vibe that permeates through the al fresco dining area is augmented by a menu that offers contemporary fare highlighted by a wealth of seafood options. Start your experience with oysters on the half shell or a couple small plates like the ahi poke with scallions or the Tuscan kale Caesar. These set the stage for hearty mains like the cioppino, Scottish king salmon with fresh corn pudding, or land-faring items such as the New York steak with whipped Yukon Gold potatoes, portabella mushrooms and Cognac sauce.